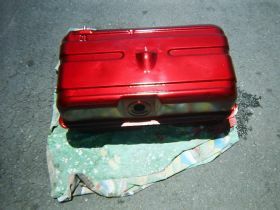 After twenty three years in the industry I started Slowys Speed Shop in Capalaba, Queensland in 2001. The business provides a vast array of services for classic car enthusiasts and we do everything a customer wants except upholstery. The workshop can hold six cars comfortably at any time and is well equipped to handle all aspects required in maintenance and restoration. We have MIG and TIG welders, swaging machines, folders and a rotisserie on site and can fabricate everything from wheel tubs to a chassis from scratch. 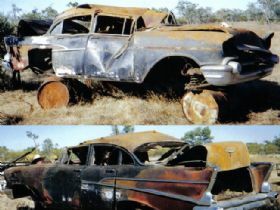 Most of the work we do is on Australian and American muscle cars and ranges from small customer specific jobs to full body off restorations. There is nothing that we wont tackle and often take on jobs that others say cant be done. The more unusual or challenging drives our passion in this business but we are only interested in working for customers that want to have the job done properly. Experience has taught us many things and to ensure happy customers well into the future we do everything to a high professional standard that will stand the test of time. Fanaticism and fussy best describe our approach to your car. 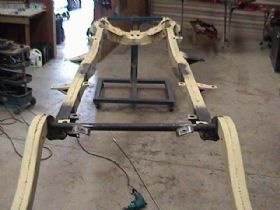 To cover off our services in depth we will start with the bodywork. 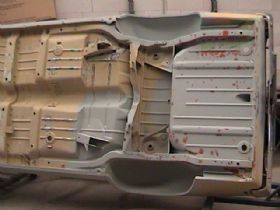 We provide smash repair work for classics, all forms of bodywork including customisation and fabrication, panel beating and fitment of replacement panels, firewall smoothing, paint removal and spray painting. 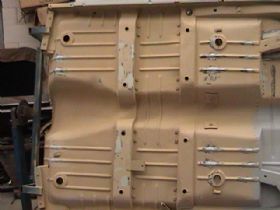 We obviously do all forms of welding and offer comprehensive rust repairs and panel restoration. 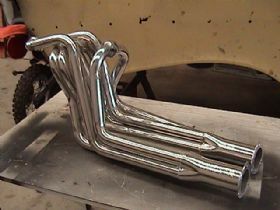 We have custom built extractors for different engine combinations and are often called on to do disk brake conversions on the older muscle cars. 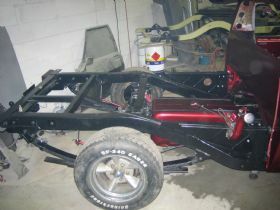 This could involve drop spindles, front and rear disks and provision for new master cylinders and power boosters. To finish off a conversion we provide all new brake lines to support the upgraded hardware. On the electrical side we can wire any component a customer desires right through to a full rewire for a total restoration. For those customers after a clean look we can secret wire most areas of the car to minimise unsightly wiring looms. On the engine front we can rebuild your existing engine or swap out your engine for a big block or a modern EFI unit. We will fabricate engine mounts to suit. When we rebuild an engine the parts are sent out for machining and the final assembly is done in house based on the customer specification. 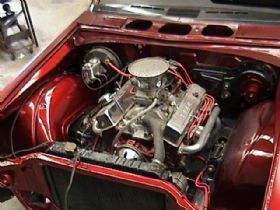 Fuel injection, carburettors, cam, lifters, conrods, pistons, rings, valves and head upgrades are all provided as are balancing, tune-ups, servicing and general maintenance such as fixing oil leaks from seeping gaskets. We can also provide unleaded conversions on your old engine to allow it run properly on todays fuel. 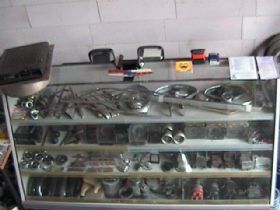 We have a variety of spare parts that we keep in stock mainly for customers cars and the restorations we will do in the future and these cover a lot of local Holden, Valiant and Ford parts and some original American parts. 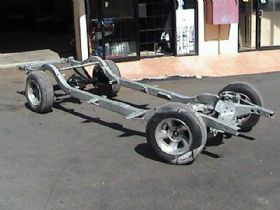 The handling of your classic is important and besides rebuilding components or providing new parts to factory specifications we also can update your classic with rack and pinion steering, adjustable shock absorbers, coil overs, power steering, new springs with varying rates and a range of different suspension setups. We also provide right hand drive steering conversions for American classics and we work closely with an engineer who is located in the same industrial estate to ensure compliance with the Department of Transport standards. With a lot of customers after more power we provide beefed up driveline components and can upgrade or swap transmissions, spec out and install appropriate clutches and axles, swap out diff centres or provide entire new rear ends. 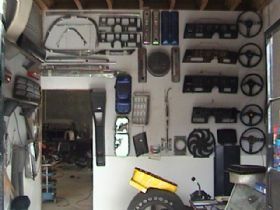 Over the years I have owned many classics which has provided me with a good source of knowledge on the cars themselves. Chevrolets including tri-fives, Camaro and a 64 and 68 have been parked in the garage over the years. Fords including an XP, XY and an XB hardtop and a Valiant VH sedan and Charger have also been driven in the past. 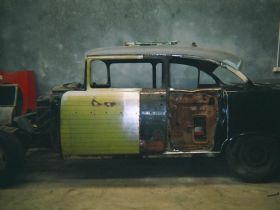 Currently I have a 60 Chev and a two door 57 that I saved from landfill. If youre the kind of person who is fussy and wants your car done right without any short cuts, whatever you have in mind we can be of assistance. Give us a call or drop by the workshop and we will gladly discuss your requirements with you.